The ladies of Nitroplus are ready to throw down. Fighting games are something I am horrible at due to the complex controls. As such, I tend to shy away from them. 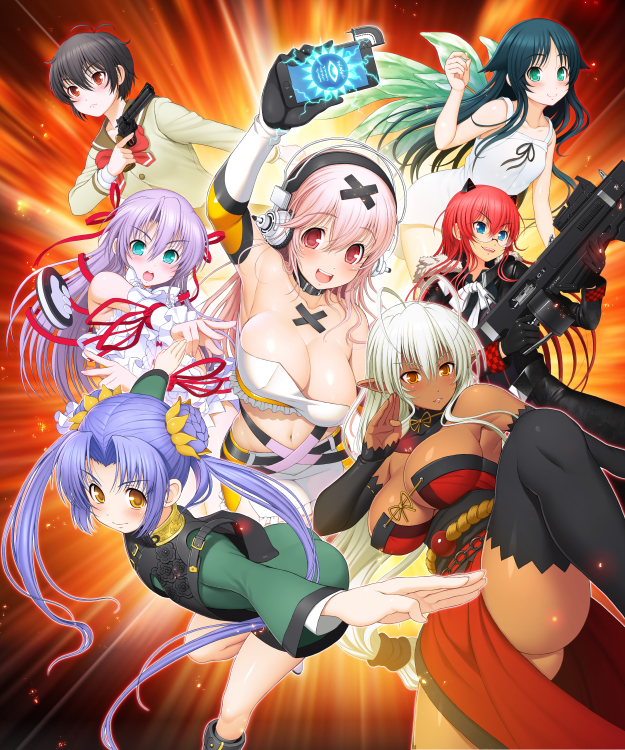 However, moe things tend to be a weakness of mine so upon laying eye on Nitroplus Blasterz: Infinite Heroines Duel I knew I had to at least give it a shot, well that and Super Sonico happens to be in it. While Sonico was not a playable character in this build (she does greet you on the menu though) the game did include eleven playable characters, eight of which were unlocked for play. In addition there are 20 additional characters that are available as assists, 16 of which were unlocked for selection. While that’s quite a lot to choose from, fortunately the game will tell you what assist characters are recommended for use with the character you selected. So if you’re a fighting game novice, like myself, you at least know you’ll be picking assists that will compliment your character. Thankfully I wouldn’t be playing this alone as the member of XSEED Games who was manning the booth was willing to play alongside me and give me a crash course in the mechanics of the game. First off though let’s start with the basics. Much like every fighting game out there your goal of course is to eliminate your opponent’s health bar. Each match consists consist of three rounds with the winner of the fight being the one to claim victory twice. You also have a super meter at the bottom of the screen that has three levels. Lastly, in regards to the screen interface you also have two portraits on the screen which represent your assist characters. There’s a small circular meter next to the portraits that will fill up over time, once it does that assist partner is ready to be called into the fight. With that out of the way let’s talk about the controls. Note the interfaces and Anna being adorable. First off, I do want to let you know we were playing using fight sticks, so these were very much arcade controls. However, the game will of course support a controller and I was able to see in the options menu that the buttons will be re-mappable and include a way to call your assist characters in at the press of a button if you’re horrible at simultaneous button inputs like me. That being said, here are the controls. You move around with the joystick, double tapping forward will of course allow you to dash, while holding back will allow you to block. Pushing up will make you jump and down will cause you to duck. You have three levels of attack, light, medium, and heavy as well as two additional buttons. The first of which is your escape action, while the other is your guard break. While each of these buttons are self-explanatory it’s throwing these five together in various combinations together that makes the magic happen. If you press escape and your light attack together you’ll summon your first assist character while escape and medium will summon your second. These assist characters function very much like the ones from Marvel vs Capcom in that they will jump in, preform an action, and then jump out. However instead of a limited number of times they can be called, you just have to wait until their meter fills back up again. If you press Guard Break and Heavy attack and have enough energy in your super meter you’ll initiate a Variable Rush. This is the great equalizer as the staffer manning the booth told me, and I have to agree. As soon as you activate the ability you simply need to start mashing buttons, after a moment your character will rush after your opponent and execute a combo based on your button inputs. While this might sound overpowered, and in the right hands it potentially could be, it still relies on your super meter and if you’re an experienced player you can probably see it coming. Fighting game enthusiasts don’t fear though as traditional commands are used for your characters super combos, called “Lethal Blazes” such as Quarter-Circle Forward and Dragon Punch Motion. The on difference though are every characters level three Lethal Blaze. The level three move for every character is executed by preforming Quarter-Circle Forward and pressing both Heavy Attack and Guard Break. Connecting with this move will not only do massive damage, but also give you a very nice looking animated cut in of your character. So, that’s the controls, but how does this game actually feel and how do the characters preform? I played three matches in order to get a feel for the game and the mechanics, Mora (Vampirdzhija Vjedogonia), Anna (Gekkō no Carnevale), and Saya (Saya no Uta.) While of course each character will play differently each will also have ten different color options so you’re sure to find something you think looks appealing. Mora was suggested as a good character for beginners and I have to agree. Swinging around a giant hammer she’s not exactly the fastest thing on the field she’s still quick enough to not feel sluggish and getting hit with that hammer of course hurts. Anna meanwhile is much quicker and relies on wings she can pull out to deal ranged attacks. Saya… Well Saya is just weird. Staying true to her origins from the infamous Visual Novel she’s from, she transforms parts of her body into grotesque appendages to strike at a distance or through the floor. In addition she does have a teleport move that allows her quickly evade an attack. While I won my matches with Mora and Anna, I lost with Saya. She’s certainly going to take a more experienced player to utilize her, but her unique attacks and combos in the hands of a skilled player will keep opponents guessing and on the defensive. Still though I enjoyed playing as all three characters and overall I had a lot of fun with one despite my ineptness for the genre. So the game is fun, but of course what about the one of the most important parts of any fighting game, the technical details. Saya: Extremely cute when she wants to be, deadly and creepy when she needs to. The game of course runs at 1080P and 60fps like any fighter should. So the action feels smooth and quick. While I couldn’t get a good handle on the music due to the noise in the hall, the sound effects and voice clips sounded fine to me. Also, despite the current build of the game being very early in the localization process I didn’t detect any slowdown or hiccups so I have hopes the game will be quite enjoyable for fans genre. So let’s sum this up, what’s my final opinion on this? 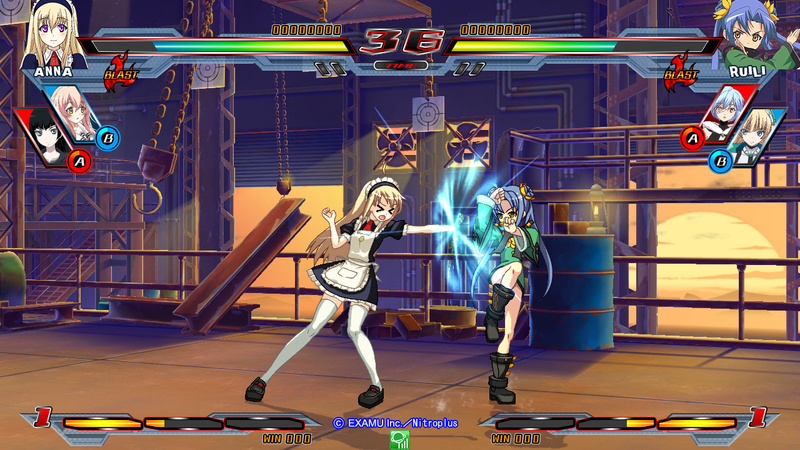 Nitroplus Blasterz Infinite Heroines Duel is actually a fun little title. While I honestly was a bit hesitant at giving this a shot due to the genre and my lack of experience with them, I still enjoyed the experience and found it simple enough that I could manage to play effectively. While it obviously won’t dethrone games like Street Fight V or Mortal Kombat X. If you’re a fan of Moe games, Nitroplus, or just want a simple fighting game you can play with a few friends regardless of experience this might be worth your attention. 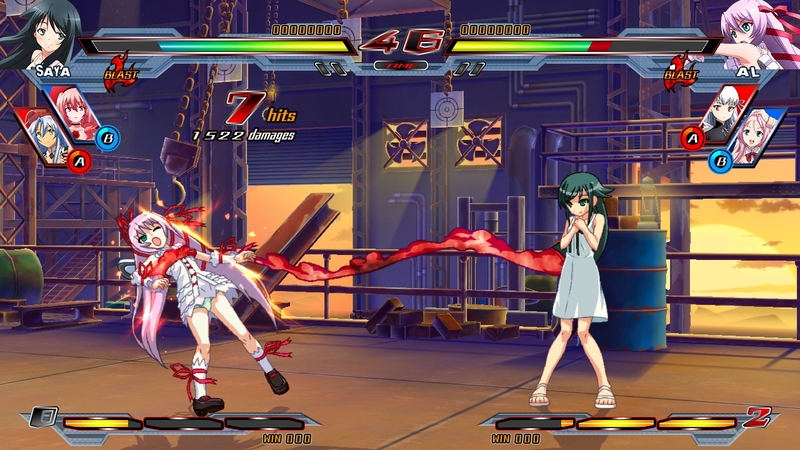 Nitroplus Blasterz Infinite Heroines Duel will be available this Winter for both PlayStation 3 and PlayStation 4.